I know how hard it can be with a child that has allergies. My own daughter suffers from dairy, soy and sesame seed allergies. Nut allergies can be particularly challenging since so many things contain traces of nuts. Well I developed these nut free truffles with you in mind. You can now enjoy healthy sweets without a trace of nuts. These nut free truffles are not only nut free, but they are dairy free, and soy free too! These delicious, nut free truffles are made with sunflower butter. Creamy sunflower butter with a decadent chocolate coating. I promise you it is delicious. A very easy recipe as well. Gluten free, grain free and vegan also. An allergy friendly sweet treat! In a food processor , combine the sunflower butter, maple syrup, coconut flour and sea salt. Blend together for a minute, then add in the chocolate chips and pulse a few more times to mix them in well. 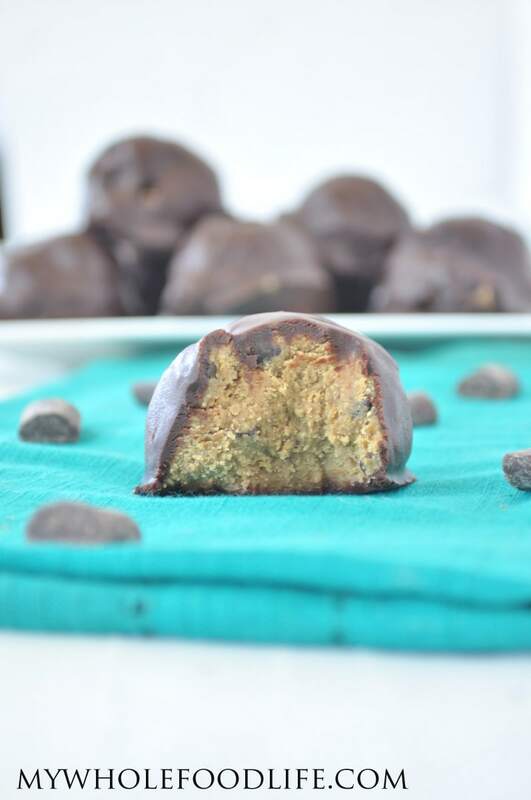 Form truffles into balls and place onto a lined baking sheet. I used a cookie scoop for mine. Stick the baking sheet in the freezer for an hour. Using a double boiler method, (see notes) melt the chocolate and the milk until everything is smooth and blended together. Using two forks, roll the truffles into the chocolate and coat each one completely. Then place them back on the baking sheet . Stick in the freezer for another hour or so. Once the chocolate has firmed back up, you can store these in the fridge. They should last several weeks in the fridge and longer in the freezer. **When I mention the double boiler method, this is all you have to do. Fill a medium saucepan with water. Place a glass bowl on top of the saucepan. Bring the water in the saucepan to a boil. Place the chocolate and milk into the glass bowl. This allows the chocolate to gently melt without burning it. Enjoy! I remember making tons of sunflower butter and jelly sandwich when I did my rotation at a child development center. The kids really loved it! I'm on the road a lot these days so this is a perfect portable snack. Thanks for the recipe, Melissa! Hope your week is off to a great start. My daughter loves sunbutter as an alternative to peanut butter, so I'd like to try this recipe! I've always avoided coconut, however. So I need to know first, please, doesn't coconut flour contain the same triggers as nuts? I'm hoping not! Thank you. It may and may not depending on your daughter. To be safe, just use another flour. Is there something I can substitute for the maple syrup? Or does it need it to bind? Can't have any sugar right now- only xylitol, stevia, etc. these look so good!!! You can probably use stevia. I'd like to make this but I do not have sunflower butter. Have you tried making it from sunflower seeds? And if yes, in a Vitamix or processor? Yes. You can make it in either a Vitamix or food processor. Be patient though. It can take a while. Thanks! You can sub any nut butter you like in this. Thanks for sharing this recipe! We recently found out my husband has a soy and peanut allergy (on top of his already diagnosed tree nut allergy). I've struggled at times with finding "treat" recipes I know he can have! You are so welcome! I hope you enjoy them! hi can i use coconut milk or almond milk ? instead of flax milk ? Hi, can you please advise what T means in your ingredients list. Thanks. The dough is delicious too! !